“I am thrilled to be collaborating with H&M and to have the opportunity of reaching their wide audience. The collection will be quintessential Versace, perfect for H&M and Versace fans everywhere,” says Donatella Versace. “Versace is one of the most important brands of recent times and their collection for H&M will be glamorous and extraordinary - everything Versace stands for. Versace is sharing with us iconic designs from the archives. This is such a celebratory collaboration and is perfect for the festive season,” says Margareta van den Bosch, creative advisor at H&M. Versace is a brand steeped in glamour to its very core. Founded in 1978 by Gianni Versace, his daring dresses and wild iconography revolutionized fashion, creating provocative styles in classical themes, all cut with an impeccable eye for design. Since 1997, Donatella Versace has continued Gianni Versace’s work as creative director, evolving the brand into a global fashion house at the forefront of what luxury means today. 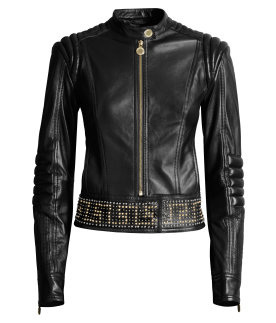 Famous worldwide for her signature wardrobe, Versace is the epitome of everything the House of Versace stands for. Versace is the latest couture house to collaborate with H&M on an exclusive designer collection, following the likes of Karl Lagerfeld, Stella McCartney, Comme des Garçons, Roberto Cavalli, Jimmy Choo and, most recently, Lanvin. For H&M. Versace has looked back to the archives to reinterpret some classic Versace designs. The womenswear collection will be dominated by dresses that express the spirit of the season, featuring studded leather, silk and colorful prints, and accessories including high heels and costume jewelry. The men’s collection will focus on sharp tailoring, including the perfect tuxedo, as well as belts and jewelry for men. For the first time in a designer collaboration at H&M, the collection will include homeware pieces including pillows and bedspread.